Well the Oscar nominations this morning had their share of surprises, sure-things, and downright inexplicable choices. The most notable (for me) being the utter snubbing of Into the Wild, which managed only 2 nominations (for Best Supporting Actor and Best Film Editing), totally missing out on expected nods for Best Picture, Director, Actor, Screenplay, and Song. This was especially disheartening for me because Wild was my baby in the race. There Will Be Blood is my pick for best film of the year, but Into the Wild really spoke to me, and I've been backing it since October. It obviously did not connect with Academy voters (who are predominantly older whites males). 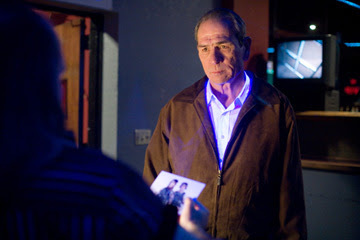 My favorite nomination of the day however, was Tommy Lee Jones' totally unexpected (but richly deserved) Best Actor nomination for In the Valley of Elah. I was also pleased to see "Raise it Up" from August Rush get nominated for Best Song, which I didn't think had a snowball's chance in hell. But the three nods in that category for Enchanted were overkill. "That's How You Know" deserves it, but "So Close" and "Happy Working Song" could have been left off in favor of more deserving tunes from Into the Wild (poor Eddie Vedder) and Hairspray. I was also glad to see Atonement score a Best Picture nod, even if it didn't end up on my top ten list, it is still a fine film that is worthy of notice, although I would have preferred to see The Diving Bell and the Butterfly in its place, whose director Julian Schnabel was nominated for Best Director while Atonement's Joe Wright was not. The out of left field Best Director nod for Juno's Jason Reitman shows large support for the film (despite only getting 4 nods...but what else could they nominate it for? ), but I doubt that will carry it to a win. His nomination is a good faith nod for future work. And I hope Michael Clayton trounces it for Original Screenplay, it's smug self-satisfaction masquerading as cleverness is starting to wear thin. I swear, if I hear one more person say "honest to blog..."
Even if you are a fan of the film, you have to admit it sticks out like a sore thumb in the company of the other five Best Picture nominees. It's nowhere near in the same league. I only hope voters will be able to distinguish between likability (seriously, am I the only one who finds Juno MacGuff to be extremely irritating and condescending?) and cinematic ingenuity. In other out of left field news, James Newton Howard's Best Score nomination was also a surprise, but a pleasant one, despite the fact that Alexandre Desplat's haunting score to Lust, Caution was ignored. The film's frank, NC-17 rated sexuality must have turned voters off, as it also missed out on a nod for Best Costume Design. Howard's score isn't much to listen to on album, but its extremely effective and atmospheric in the film, and that final piano piece is a beautifully understated knockout. My WTF nomination is Surf's Up for Best Animated Feature. Really? Over Golden Globe nominee Bee Movie and the groundbreaking Beowulf? And did Ben Lyons really say this was between Ratatouille and Surf's Up for the win this morning on E! after the announcements? Yes. Yes he did. Also - Norbit is now officially an Oscar nominee, and Transformers has more nominations than Into the Wild, Before the Devil Knows You're Dead, I'm Not There, The Assassination of Jesse James by the Coward Robert Ford, and Zodiac. Let the wailing and gnashing of teeth begin. I'm sure I'll have more to say in the coming weeks. These are just my initial thoughts and impressions regarding the Oscar race. Is it still No Country's to lose? Or will voters be sick of all the darkness present 4 of their 5 choices? The race isn't over...it's just starting to get interesting.